Enter your name and email address below and click "Subscribe" to have free Chemistry tips delivered to your inbox weekly. Note: For course links to launch, disable popup blockers or hold the ctrl key while clicking the link. To preview the core tutorial, problem drill and cheat sheet on this 24-hour visual series, click the link below to get instance access. This series provide simple yet easy-to-understand tutorials in flash movies for core concepts in organic chemistry – the ones that are fundamental yet difficult to master. 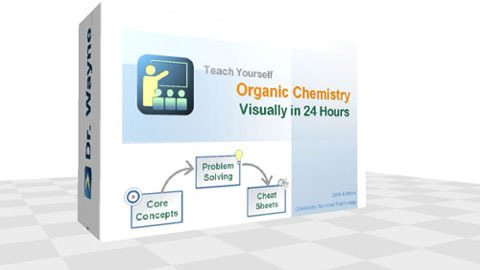 In this core unit, you will build the basics to the organic chemistry mastery. With these skills, you will build a solid foundation to understand chemistry and its problem solving. In this core unit, you will learn the various organic compounds and reactions based on the typical functional groups. In this core unit, you will learn the various spectroscopies and how they can be used for organic structure determination. In this core unit, you will learn all about the reactions and mechanisms – the core of organic chemistry. In this core unit, you will learn all about the biological aspects of organic chemistry. and Mathematics Survival Publishing are the divisions of Rapid Learning Inc.